Do you love entertaining with a touch of class? So does your "Barbie" dollhouse. Get Ready for Barbie's Premiere Dinner Party. All the Who's Who of Barbiedom will be there. 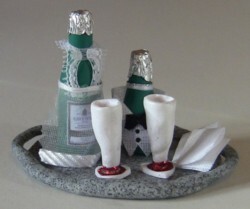 Your favorite fashion doll or "Barbie" will be the talk of her "small" community as she entertains in style with these miniature wine bottles and ensemble consisting of tiny wine bottles, glasses, tray and napkins. Of course Barbie does like to do it up in style. Why else is she the leading icon of her neighbourhood? Doing it up in style is her passion as she entertains all her celebrity friends anyway. Why shouldn't she be at the top of her game just like you? Made of polymer clay, lace, and imagination, let these tiny miniatures wine bottles tell you where they should go. All that's missing is your own imagination. Deciding where they will suit your own doll house environment is the most fun of all. 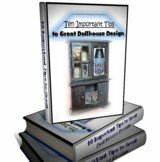 So get your thinking cap on and start envisioning this doll house scene. Designing in miniature is a breeze compared to full life sized examples. However as you do design in mini, do put all of you into it. Who knows where these designs will take you? Maybe they will foster the next exciting additions to your full sized world. Stranger things have happened. This set is both a collectible and for play. However it is definitely for the child whom you would classify as "one who takes care of her toys". One of maturing standards. It basically is not meant for a younger child, ages 3 and under, as it has tiny parts that a small child could choke on or swallow if unsupervised. So take care in how it is handled in any child's playtime. Dimensions: Tray - 3.25"x 2.25", Largest Bottle - 2.25"h Scale size: Playscale. Only 1 Available.